Chitodent® toothpaste with the active ingredient chitosan is a salicylate-free toothpaste. This is guaranteed for all components of the formulation including the aroma. What is a salicylate-free toothpaste and when is a toothpaste free of salicylate? Salicylate-free toothpaste is a cosmetic product which does not contain any extracts, essential oils, essences, tinctures, or aromas with salicylate-containing ingredients. Salicylate are salts of salicylic acid. These are found in the leaves and flowers of many plants. Salicylic acid is used in cosmetics, in extracts, gels, essences and balsams. The usual minty taste in toothpastes is generally based on menthol, which is almost always obtained from field mint or peppermint (Mentha piperita) and contains salicylates. When is it advisable to use a salicylate-free toothpaste / menthol-free toothpaste? Chitodent® salicylate-free toothpaste / menthol-free toothpaste is sought after by homoeopathy patients who cannot tolerate salicylates; for example those diagnosed with Samter’s syndrome or who have chosen Dr. St. Amand’s guaifenesin-based treatment to fight fibromyalgia, an increasingly common autoimmune disease. Avoiding salicylates is essential to Dr St Amand’s guaifenesin treatment. Guaifenesin relieves fibromyalgia according to Dr St Amand, but it competes at the receptors with salicylates. Salicylates cancel out the guaifenesin. During guaifenesin treatment by Dr. Amand, all products which come into contact with the skin or mucous membranes in a concentrated amount must be checked and replaced if necessary. Anyone undergoing guaifenesin treatment by Dr. Amand is looking for cosmetic products which do not contain salicylates or salicylic acid. Fibromyalgia and Samter’s triad patients also long for taste. People who can not tolerate salicylates because they are on guaifenesin treatment long for a fresh taste in the mouth. They are not allowed to use products containing menthol, since these are almost always obtained from field mint and peppermint (Mentha piperita) and contain salicylates/L-Menthol. Other refreshing extracts of herbal oils usually contain a lot of salicylate. Anxious fibromyalgia and Samter’s triad patients ask: Where does the taste of menthol-free Chitodent® come from? Chitodent® menthol-free toothpaste tastes mint-like, slightly sweet and is refreshing. The taste is based on its specially reconstituted, salicylate-free, menthol-free flavouring. Chitodent salicylate-free toothpaste / menthol-free toothpaste does not contain any L-Menthol in the flavouring. Is salicylate-free toothpaste effective without herbal ingredients? Helmuth Focken Biotechnology e.K. provides the homoeopathy-compatible Chitodent® formulation for a salicylate-free toothpaste / menthol-free toothpaste: a cosmetic with the natural ingredient chitosan. The chitosan is not of plant origin. The chitosan is derived from chitin which is found everywhere in the natural world. Chitin is a structural component of the cell walls of fungi, the exoskeletons of crustaceans, crabs, and insects. Chitosan, a derivative of chitin, is structurally very similar to cellulose. Both consist of polysaccharides, innumerable nitrogen chain sugar components, and are freely available in nature. Many extensive global research studies have confirmed the effectiveness of chitosan, which does not have allergenic effects. Chitosan is a real wonder drug for good teeth and healthy gums. Chitosan has an antibacterial effect on pathogens, plaque, caries and periodontal disease. Chitosan has a stimulating effect on wound healing. Chitodent®, the salicylate-free toothpaste / menthol-free toothpaste is homoeopathy-compatible and without fluoride. The toothpaste is free of salicylate, contains no herbal ingredients, and is highly effective thanks to the active ingredient chitosan. Background information on chitosan . Chemistry to understand guaifenesin, salicylate-free toothpaste / menthol-free toothpaste / toothpaste without mint flavouring and why the aroma of Chitodent® is used for a toothpaste that is free of salicylate. Why the menthol-free toothpaste Chitodent® tastes fresh and is still a salicylate-free toothpaste. Chitodent® toothpaste without menthol, Chitodent® toothpaste without salicylate. For consumers, it is hard to tell whether a toothpaste is without salicylate. Dental care product manufacturers are not required to list salicylic acid or methyl salicylate under aroma in the INCI (international nomenclature of cosmetic ingredients). For people on homoeopathic treatment, people diagnosed with Samter’s triad or those undergoing guaifenesin treatment for fibromyalgia, it can be very important to know whether a toothpaste contains salicylate. If you have a toothpaste without menthol, this can indicate that the toothpaste does not contain salicylate. What alternative aroma can be used in a toothpaste without menthol? Is there any toothpaste without salicylate but with taste? Chitodent® toothpaste uses one of the few formulations for a reconstituted aroma based on a pure essential oil, containing no salicylates, and mainly composed of carvone. Essential oils are often not quite pure. Even salicylate free essential oils such as peppermint oil from a few field-harvested plants of the Mentha family (Mentha piperita) can contain small amounts of L-menthol. Even if it had low L-menthol concentrations, the essential oil would not conform to homoeopathic standards and would not be an option for either fibromyalgia patients on guaifenesin treatment or people with Samter’s triad. Therefore, in the formulation for Chitodent® toothpaste without salicylate and toothpaste without menthol, the oil, mainly composed of carvone, is ‘taken apart’ and put back together (reconstituted) without the problem ingredients. Chitodent® toothpaste is a dental care, homoeopathy-compatible natural cosmetic which originated from an EUTEC research project and has been declared a toothpaste without salicylate and a toothpaste without menthol. 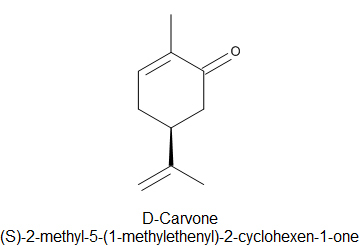 Carvone is a monocyclic monoterpene ketone. 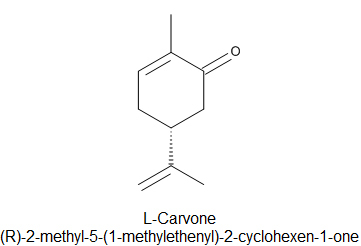 the (R)-(−)-Carvone [also called L-(−)-Carvone or (−)-Carvone for short]. 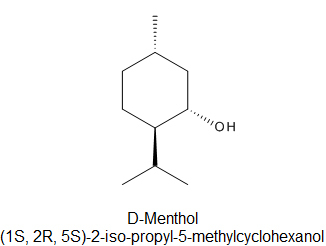 In addition to menthol, three more diastereomeric pairs exist (also called menthol isomers), which have three asymmetric C atom bonds: neomenthol, isomenthol and neoisomenthol. The natural left-handed -(-)-Menthol is present in many essential oils, especially in mint oils and is, according to Dr St Amand, to be strictly avoided while on guaifenesin treatment, as it is the strongest guaifenesin blocker. Toothpaste without menthol is rare. Menthol is associated with freshness and it is therefore, used in almost all toothpastes and mouthwashes, and in chewing gums, ointments and shower gels. Menthol is mainly obtained from field mint. Field mint (Mentha arvensis), like peppermint (Mentha piperita) contains L-menthol. Salicylic acid is also used to make dyes, perfumes and the acetylsalicylic acid. source: Salicylic-acid-skeletal von Image: Aspirin-skeletal.svg originally by Benjah-bmm27Booyabazooka, edited by Fvasconcellos – Image:Aspirin-skeletal.svg. Lizenziert unter Gemeinfrei über Wikimedia Commons. Salicylic acid is an o-hydroxybenzoic acid and its methyl ester occurs naturally in essential oils of the plants, leaves and flowers of many plants. During guaifenesin treatment for fibromyalgia both natural and synthetic salicylates must be strictly avoided. According to Dr Paul St Amand, salicylates block the action of guaifenesin, because they block a receptor in the kidneys which the guaifenesin should lock into. Salicylates must also be avoided if you are diagnosed with Samter’s triad. 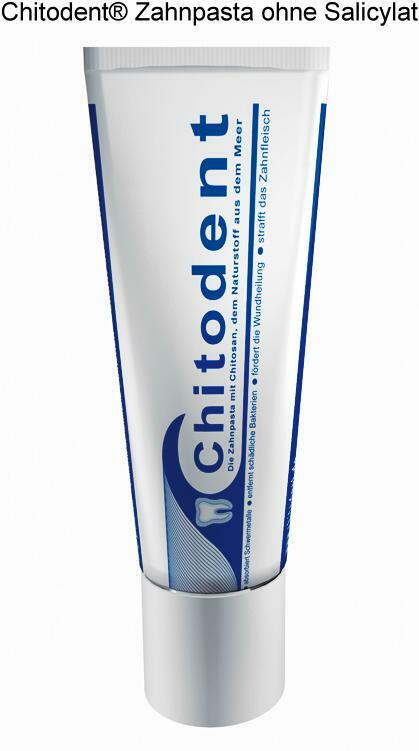 Chitodent® is a toothpaste without salicylate. The reconstituted aroma of Chitodent® also does not contain any salicylate / methyl salicylate. Salicylic acid and guaifenesin both have an aromatic ring. Salicylic acid has an OH group (an alcohol, phenol here) with an acid group (COOH) in the α-position. Guaifenesin has two modified OH groups (ethers) in the α-position to each other on the aromatic ring. Therefore competing reactions are likely to occur between significantly smaller salicylic acid derivatives and guaifenesin at the respective receptors. Like guaifenesin and salicylate, the two carvones have a six-membered ring, but this does not have double bonds and is not aromatic. 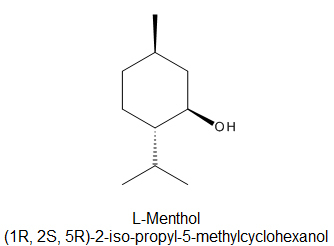 Menthol, like salicylic acid and guaifenesin, also has another functional group in the α-position. In carvone, the ketone group and the isoprene unit are in the β-position to each other. Which of the flavouring ingredients in the toothpaste: field mint, peppermint, menthol, mint oil and essential oils, are off limits during guaifenesin treatment by Dr.St.Amand? How can Chitodent® menthol and salicylate-free still taste fresh without essential oils? Chitosan as the active ingredient in Chitodent®. Background on fibromyalgia and guaifenesin treatment by Dr.St.Amand. Fibromyalgia is an autoimmune disease that was recognized only recently and is difficult to define. Medical experts are divided about the symptoms and the cause. Fibromyalgia is considered medically incurable. The American doctor Dr.St.Amand, who was himself diagnosed with fibromyalgia and cured himself with guaifenesin, believes fibromyalgia is a metabolic disorder. He argues that in fibromyalgia, because of a genetic defect, the body can no longer excrete excess phosphate, or only do so at a reduced rate. The excess phosphate appears to be stored with calcium in the body in the joints, then in the tissues (e.g. muscles, tendons or ligaments). These deposits can lead to the discomfort and pain associated with fibromyalgia. Himself a fibromyalgia sufferer, Dr.St.Amand tested himself and recognized that guaifenesin can resolve the metabolic disorder which he believes causes the condition. He developed the guaifenesin treatment. Guaifenesin treatment for fibromyalgia by Dr.St.Amand. Guaifenesin is mainly used in cough medicine to dissolve mucus. Dr.St.Amand found that guaifenesin also has a regulating effect on phosphate metabolism and tested guaifenesin himself to resolve this metabolic disorder, which he believes causes the condition. Guaifenesin acts in the course of fibromyalgia treatment by helping the cells let go of the stored excess minerals by ensuring that the kidneys can excrete the excess phosphate and calcium compounds again. Guaifenesin should be dosed individually for each person suffering from fibromyalgia. Salicylate-free during guaifenesin treatment According to Dr.St.Amand salicylates compromise guaifenesin. If salicylates are absorbed via the skin or mucous membranes, according to Dr.St.Amand they inhibit the effect of guaifenesin by blocking the receptors in the kidneys which guaifenesin should lock into. During guaifenesin treatment by Dr.St.Amand, all products which come into contact with the skin or mucous membranes in a concentrated amount must be checked and, if they contain salicylates, replaced by salicylate-free products. This applies to cosmetics, toiletries, medical ointments, supplements and especially toothpastes. Fibromyalgia patients undergoing guaifenesin treatment by Dr.St.Amand and Samter’s triad suffers are looking for a toothpaste that is salicylate free. This is especially difficult. Using the INCI (international nomenclature of cosmetic ingredients) content declaration, it is almost impossible to recognize which toothpaste is salicylate free. The frequently asked questions of fibromyalgia sufferers about using a suitable toothpaste during guaifenesin treatment by Dr.St.Amand are answered below. A salicylate-free toothpaste without herbal ingredients is provided by Helmuth Focken Biotechnik e.K. – Chitodent®. The active ingredient is chitosan. Fibromyalgia patients must use a menthol-free toothpaste. You’ll love this homoeopathic formulation during your guaifenesin treatment. The same applies if you are diagnosed with Samter’s triad. Our chitosan is a natural ingredient of non-herbal origin. Many extensive global research studies have confirmed the effectiveness of chitosan, which does not have an allergenic effect. Chitosan is a real wonder drug for good teeth and healthy gums. Immediately after thorough cleaning, a pellicle forms on the tooth surface. This is an invisible acellular film that protects the tooth from erosion and acid attack. This film is composed primarily of proteins in saliva. Because of their own charges, these bind electrostatically to the calcium and phosphate groups of the apatite in hard tooth tissue. Since the pellicle is also the starting point for bacterial colonization, to avoid erosion it is important, to both minimize damage to this protective layer by using particularly soft cleaners, and to equip it with antibacterial defences. Antibacterial defence is advantageously achieved by chitosan. Chitosan supports the film binding on the polished enamel. The chitosan is adsorbed into the hard tooth tissue and the pellicle and develops positive effects. Chitodent® salicylate-free toothpaste is homoeopathy-compatible. The formulation is without fluorine. Thanks to the active ingredient chitosan the salicylate-free toothpaste acts without herbal ingredients, as the polycation chitosan interacts with polyanionic gums and certain germs. Creating a salicylate-free toothpaste without herbal ingredients but with taste is a challenge. Most refreshing ingredients of conventional toothpastes are based on the oils and aromas of field mint or peppermint, or produced from the essential oils of plants, leaves and flowers. They almost always contain salicylates. Fresh taste is a pleasure for homoeopathy patients, especially those who need a salicylate-free toothpaste, because these are so difficult to find. The menthol-free toothpaste Chitodent® is L-Menthol free. It tastes fresh because of its specially developed, restored flavouring, based on L-Carvone. Besides the refreshing flavouring, the astringent effective chitosan also influences the taste sensation. The chitosan makes the Chitodent® menthol-free toothpaste with L-Carvone feel even more refreshing. People on guaifenesin treatment have to give up on many flavours because they have to avoid salicylates. Now they can enjoy an effective toothpaste with a problem-free flavouring. Chitodent® salicylate-free toothpaste originated from a research contract with EUTEC. 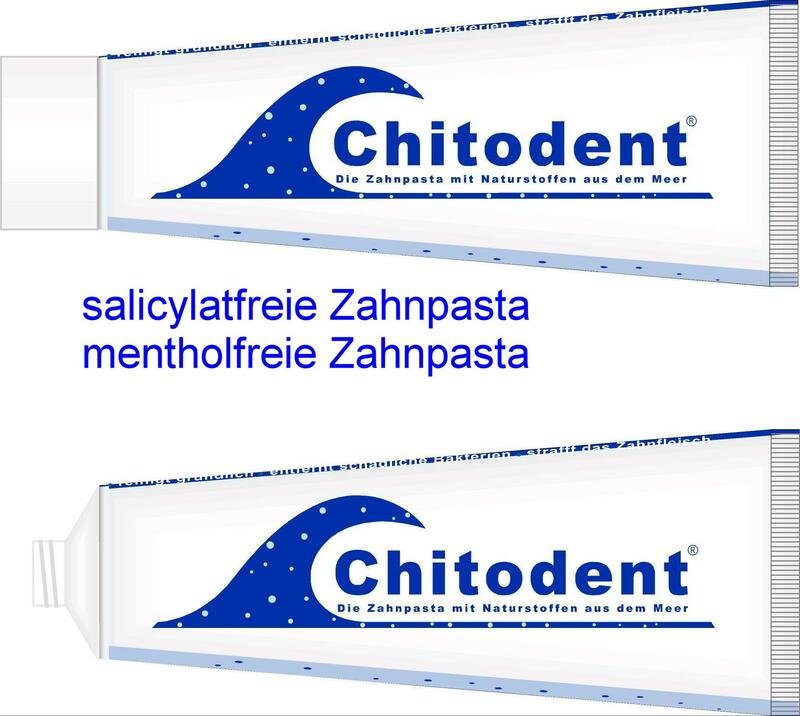 The Chitodent® formulation is available in a 75ml tube in German pharmacies under PPN 2239231 and in Austria under PPN 4064273. Overview and background on guaifenesin treatment by Dr Amand. Which of the flavouring ingredients in the toothpaste: field mint, peppermint, menthol, mint oil, essential oils are off limits during guaifenesin treatment by Dr St Amand? Why Chitodent® menthol-free toothpaste is a salicylate-free toothpaste with taste. Fibromyalgia and Samter’s triad patients find it almost impossible to identify salicylate-free menthol-free toothpaste using the INCI (International Nomenclature of Cosmetic Ingredients) content declaration. Fibromyalgia and Samter’s triad sufferers look for help online. In particular fibromyalgia patients finding out about guaifenesin treatment by Dr Amand need to know what products contain salicylates and what product descriptions indicate hidden salicylates. People suffering from Samter’s triad need the same information. Caution is advised when using oils, extracts, gels, essences and tinctures. During guaifenesin treatment by Dr Amand, you should only use a salicylate-free menthol-free toothpaste, which should be a toothpaste without mint flavouring / mint oil. Quote: “Menthol, like mint oil, would be absorbed through the oral mucous membranes within 15 seconds. Both ingredients are the strongest guaifenesin blockers and equally compromise the guaifenesin treatment by Dr Amand. Guaifenesin treatment by Dr Amand is based on avoiding salicylate. During guaifenesin treatment by Dr Amand it makes sense to use a salicylate-free menthol-free toothpaste. This claim is misleading, however: Toothpaste without mint flavouring for guaifenesin treatment by Dr Amand. Not all mint oils contain salicylates. The frustration that guaifenesin treatment by Dr Amand only allows the use of toothpaste without mint flavouring / mint oil is probably caused by copying the author online and lack of knowledge about chemical and botanical connections. Almost all mint oils contain many salicylates, but not all mint oils contain salicylates. Basically toothpaste without mint flavouring is rare. Mint flavouring and menthol are usually obtained from field mint and peppermint. In Europe we associate the minty flavour and menthol with freshness. Minty and menthol type flavourings can be found in almost all toothpastes and mouthwashes, chewing gums, ointments, shower gels, etc. Menthol is derived mainly from field mint. Field mint, like peppermint (Mentha piperita) contains a salicylate. For people using guaifenesin treatment by Dr Amand to fight fibromyalgia and Samter’s triad, off-limits ingredients include field mint and peppermint with L-menthol, and also products based on wintergreen plants. Methyl salicylate, the methyl ester of salicylic acid, is isolated from the leaves of wintergreen plants by steam distillation. Products with wintergreen flavouring cannot be used by people suffering from fibromyalgia and Samter’s triad. Fibromyalgia and Samter’s triad patients look for salicylate-free menthol-free toothpaste. Because Chitodent® salicylate-free menthol-free toothpaste tastes like mint, slightly sweet and fresh, they aren’t sure about it. Where does salicylate-free menthol-free Chitodent® get its taste from? The taste sensation of Chitodent® toothpaste is due to its specially reconstituted flavouring. Anxious fibromyalgia and Samter’s triad patients looking for a toothpaste without mint flavouring ask: Where does salicylate-free Chitodent® get its taste from? Fibromyalgia and Samter’s triad sufferers have had to stop using so many taste ingredients, that they describe the taste of Chitodent® as terrific. Fibromyalgia suffers undergoing lengthy guaifenesin treatment by Dr Amand have often had to give up many familiar taste experiences. It is no wonder that they – like Samter’s triad suffers – long for taste. The salicylate-free menthol-free toothpaste, Chitodent® does not taste bland when you brush your teeth; it is mint-like, slightly sweet and fresh. The taste sensation of Chitodent® toothpaste comes from its specially reconstituted, salicylate-free flavouring. Chitodent® salicylate-free menthol-free toothpaste is a homoeopathy-compatible formulation contains the active ingredient chitosan and is without fluorine. Although Chitodent® tastes fresh, it does not contain L-Menthol, which contains salicylates. The fresh taste of Chitodent® is based on L-Carvone. The oil on which the flavouring of Chitodent® is based was analytically ‘taken apart’ and reassembled (reconstituted) but without the ingredients that cause problems for homoeopathy patients. The reconstituted flavouring of Chitodent® contains no salicylate, no methyl salicylate, no menthol and no essential oils with salicylates. Toothpaste without mint flavouring for guaifenesin treatment by Dr Amand. Overview of guaifenesin treatment by Dr Amand. Why Chitodent® is effective as a salicylate-free menthol-free toothpaste without herbal ingredients. A salicylate-free toothpaste with taste: the best solution for fibromyalgia patients on guaifenesin treatment and people who are suffering from Samter’s triad. Salicylate-free toothpaste with taste is a blessing for people with fibromyalgia who are undergoing guaifenesin treatment and people who are suffering from Samter’s triad. People who are suffering from Samter’s triad and patiens on guaifenesin, as proposed by Dr St Amand, to fight fibromyalgia have to give up almost all refreshing mouth care products during their treatment. There are hardly any toothpastes which are free of menthol, oils or aromas of field mint or peppermint. The refreshing ingredients of most toothpastes are extracted from essential oils of plants, leaves and flowers. Almost always, they contain many salicylates. Chitodent® a toothpaste free of menthol. Chitodent® is a salicylate-free toothpaste with taste. Chitosan toothpaste free of menthol (contains no L-menthol) and essential oils. Chitodent®, the salicylate-free toothpaste with taste, is sought by those people who want a chitosan toothpaste, homoeopathy patients, fibromyalgia patients undergoing guaifenesin treatment, and people who are suffering from Samter’s triad. The chitosan toothpaste contains no L-menthol and no essential oils in the aroma. Toothpaste free of menthol and free of essential oils does not mean giving up on taste. Because of its specially produced, restored flavour based on L-Carvone, Chitodent® toothpaste tastes fresh. Especially during guaifenesin treatment as proposed by Dr Amand, fibromyalgia sufferers find Chitodent®, a salicylate-free toothpaste with taste, exhilarating. The salicylate-free toothpaste with taste contains no herbal ingredients. The efficacy of Chitodent® toothpaste is based on the active ingredient chitosan. Chitosan, a derivative of chitin, is very similar to cellulose in structure. Both are polysaccharides, composed of innumerable nitrogen chain sugar components, which are freely available in nature. The polycation chitosan interacts with polyanionic gums and germs. Chitosan forms a protective film. Which of the flavouring ingredients in toothpaste: field mint, peppermint, menthol, mint oil, essential oils are off limits during guaifenesin treatment by Dr St Amand?